The Waiting Room Lounge was the place to be Friday night, June 23, 2017, as it was Midwest Elite Concerts's 7th annual Great American Metal BBQ. There was metal! There was BBQ! It was a great night to support the local scene! Mindflight opened up the show. Comprised of members from such bands In the After, Aces Load'd and Fork in the Road, they were joined by DJ Madix aka Patrick Kirschbaum handling the turntables. A band that comes to mind that they sound like is Incubus: melodic singing, turntable influenced, heavy guitars. Later in their set, they were joined by Eric Tomes of Awaiting Eli for two songs, including a stellar cover of System of a Down's "Aerials". I hope they release some music because what I heard was really promising. Next band up was prog metal band Sovereignty. Went in with fresh ears and came out a fan! I could hear Rush, Dream Theater, Coheed and Cambria, and the Dillinger Escape Plan in their playing. And then later into the set, they covered Coheed and Cambria's "No World for Tomorrow". Ryan Lieb's vocals were on point and Dakota Horrell melted faces. The rhythm section was tight. The whole band was locked in. They finished off their set with "Sigil", the first single they released last year, as well as welcomed drummer Ryan Hansen into the band. 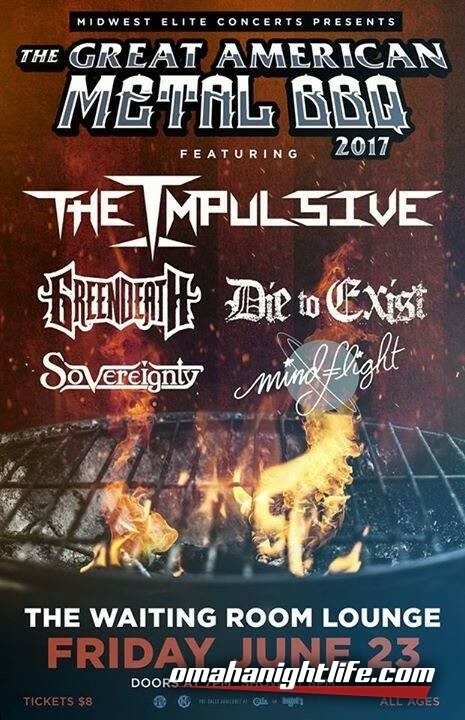 If you're into the bands I mentioned above, check out Sovereignty because you will not be disappointed. Right after Sovereignty was Die To Exist. They were the only band on this bill that I've seen before. It seems every time I see them, they get better and better with their live performance. I think they are one of Omaha's music scene's hidden gems. They don't do a whole lot of shows, but every time they play, it's magic. Playing songs off their latest album, Gothic Demonic, their brand of metalcore is nothing to mess with. They even threw in a metallic cover of Local H's "Bound for the Floor". They have a new album coming soon, so keep your eyes and ears for that because I think they will top Gothic Demonic. The direct support for the night was Des Moines's Green Death. Having recently opened a couple shows for their brothers in Stone Sour, they came to Omaha, guns ablazing. Playing songs from their recent EP, Pure Torture, as well as other songs in their back catalog, even songs that haven't been released, yet, they played fast, heavy, and loud. Ryan Berrier was a force behind the kit. Sol Bales sang with passion and fury. Fill-in lead guitarist (and John Oates-metalhead doppelgänger) Joe Kiplinger made his case of being a permanent member, shredding his guitar to bits. What a very energetic live performance by the band. If you want to check out their live show, they're opening for Havok at the Lookout Lounge next month, so don't miss out on these midwest metal legends. 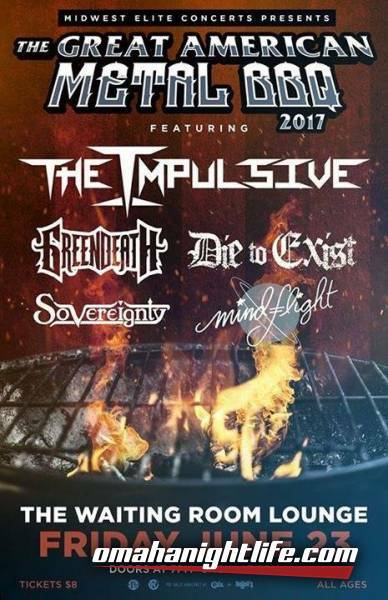 And finally, the headliner of the Great American Metal BBQ was The Impulsive. They've have been getting a good following in the last year, with touring and being a part of the Hard Rock Hotel and Casino Sioux City's Road to Vegas competition. Playing songs from their two EPs, plus a couple new ones, they set it off with a bang. Jake Mathias McDermott sang his heart out. Shane Thomas Vogel's vocals were majestic. Jake Ramrod Loehr became Shreddy Krueger, with his leads being top notch and sharp. Chris McCandless, who just joined the band this year, is an excellent addition with his versatile bass playing, even did a bass solo to "Colt 45" by Afroman. They finished the night off with a cover of the Scorpions anthem, "Rock You Like a Hurricane", a perfect song to end the Great American Metal BBQ. Definitely would see all these bands, again. Food was great. I will, without a doubt, definitely be at next year's Great American Metal BBQ. Good vibes all around.